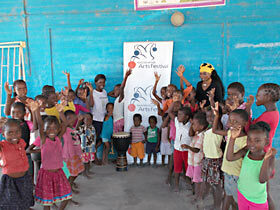 We are a charity, working in partnership with Omaleshe Projects Namibia, using the teaching of dance, drama and drumming, and soccer as a means of raising HIV awareness and protection of harm from abuse amongst children. We believe implicitly in the physical and mental benefits that the energy and joy of dance, drumming and football brings for children living in difficult circumstances. The HIV prevalence rate in Namibia is estimated at around14% (UNAIDS 2012), and is likely to be higher in the regions within which Omaleshe Projects operates. This means that around 220,000 people out of a population of 2.1 million in Namibia, are living with AIDS and an estimated 76,000 Namibian children have been orphaned by AIDS. Furthermore the level of gender based violence is high (Amnesty International Report; 2007) with 55,000 reported cases in the last 4 years, particularly of passion killings and a high level of children being raped. Watch our new video to get a greater insight into the work we are doing.